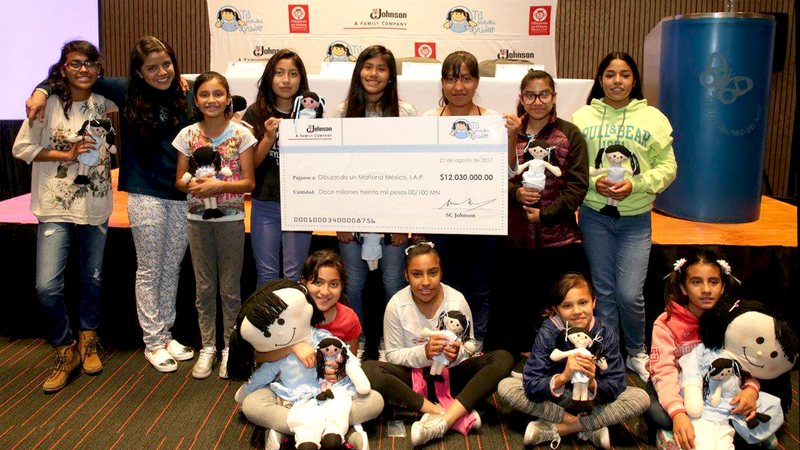 Corporate Social Responsibility: SC Johnson donations help girls and young women rise above poverty, homelessness and neglect in Mexico. In 12 years, SC Johnson has donated over 94 million pesos ($5+ million US), helping more than 30,000 children in Mexico. Wherever we are as a company, we want to make it better because SC Johnson is there. That's what social responsibility means to us. In Mexico, where more than 55 million people live in poverty, a key area of focus for us is helping girls and young women rise above homelessness and neglect. That’s why, working with our partner Dibujando un Mañana, we’ve donated over five million US dollars in recent years toward the Tú Peudes Ayudar program to provide education, training and counseling for girls. Sample projects have included building a computer lab at a school, remodeling a support home and providing counselors at group homes. Our collaboration with Dibujando un Mañana extends our long history of philanthropy to help better the lives of families. Since we started the Tú Peudes Ayudar program 12 years ago, we’ve donated more than 94 million pesos (over $5 million US). This has benefitted almost 34,000 children in 18 states of the Mexican Republic. Through its network of over 350 supported institutions, Dibujando un Mañana provides a link between companies and individuals who want to help, and institutions that need assistance.